The sell sheets for TU&H have been posted for a while on this one. There are the usual inserts, and one-per-box autogamers. But the selling point is, of course, the 330-card base set. A certain player who should have been card #645 in series two, is listed on the checklist as card #UH1. Then again, this is Topps, and given their track record this year I wouldn't put it past Topps to find a way to gimmick this up as well. 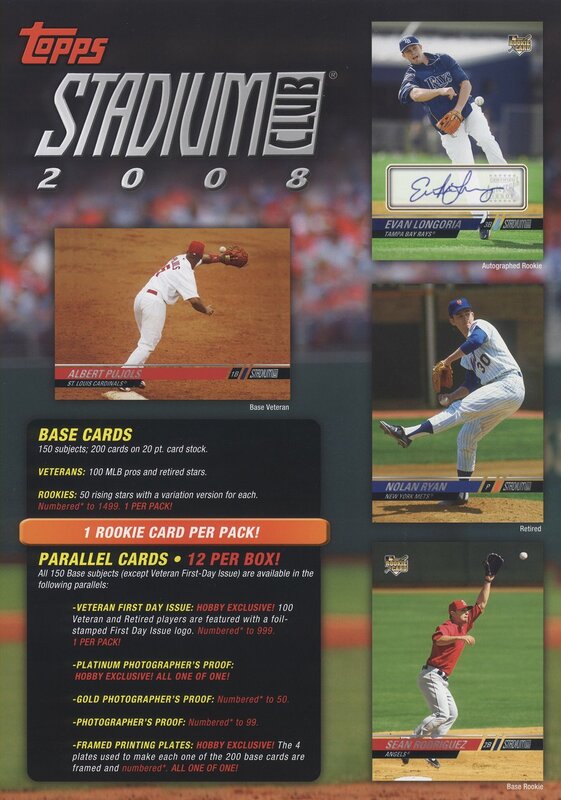 2008 Stadium Club is starting to look a lot like last year's Ultra SE after all, as Topps will release a stripped down version for retail. That the good news. The bad news: I finally figured out what's actually in Stadium Club. Of the 150 cards in the base set, 50 are gimmicked "rookies" each numbered to only 1499 copies. If that's not bad enough, while each Hobby five-card pack will have a base rookie, retail has a "Retail Exclusive Rookie First Day Issue Parallel Card." So, are we supposed to believe that the base set rookies are Hobby-exclusive and the retail (read: the version for the rest of us) is stuck with a one-per-pack parallel? Base Set: 220 cards (numbered 501-720). 45 cards are of rookies, 35 will be short-printed -- no odds stated. Each pack will have two cards from the Topps Updates & Highlights set -- therefore giving you an excuse NOT to buy TU&H. Inserts: 15 Rookie Performers, 10 Then & Now, 10 2008 Flashbacks. Sweet! Birthday present for me! Adding the U&H cards is crap. I'm about done with Topps base. I can't believe I just typed that. Where'd you find this info? I want to go check it out for myself. Wait, what? Why did they do that with the Heritage packs? If I wanted crappy looking Topps cards, I'd buy crappy looking Topps packs.